The development lifecycle of NPM packages is fast. You’ll regularly notice releases that contain new features or bug fixes. Over time, your project’s dependencies go out of date and you need to invest time into updating the third-party packages. The NPM CLI shows outdated packages in your project. Run npm outdated in a project directory to show a list of outdated packages. Review the installed version of a module, the wanted version satisfying the package’s version range and the latest version. The downside: there’s no command in NPM’s CLI to update all packages to their latest version. You need to manually go through your package.json file and bump all versions. But wait, there’s help! 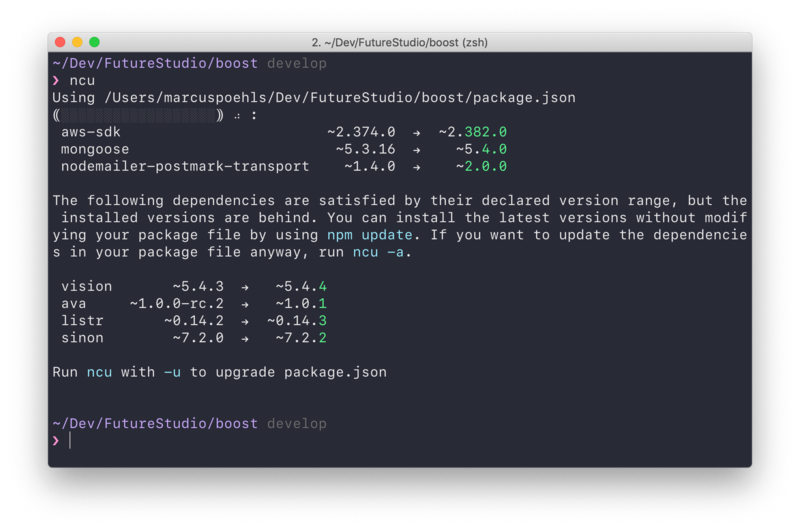 update the dependencies in your package file anyway, run ncu -a. Notice that the list of outdated packages is different from NPM’s overview. The first list includes all packages that can’t be installed due to the defined version range in your package.json file. You can see the leading tilde symbol ~ for each version which means only patch updates satisfy the range. Each item in the list is either a minor or major update. The second list shows all packages that would install with the next run of npm update. Their version range still satisfies the latest release and installing updates does not need a version bump. # the same as "ncu --upgradeAll"
The -u flag will update all packages that didn’t satisfy the version range (major and minor versions in this example). The -a flag is responsible for bumping the versions that would still satisfy the range. That’s it! All your dependencies are up to date and require the latest version.